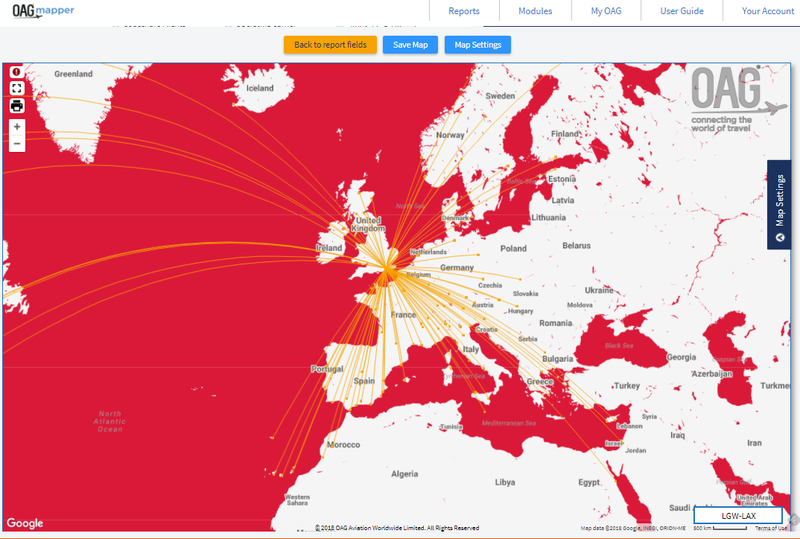 The new OAG Mapper is a powerful tool allowing you to visualise connectivity. You can create and customise route maps for existing scheduled air services as well as hypothetical airline operations. Mapper is located on the Analyser home screen, along with the other Analyser modules. 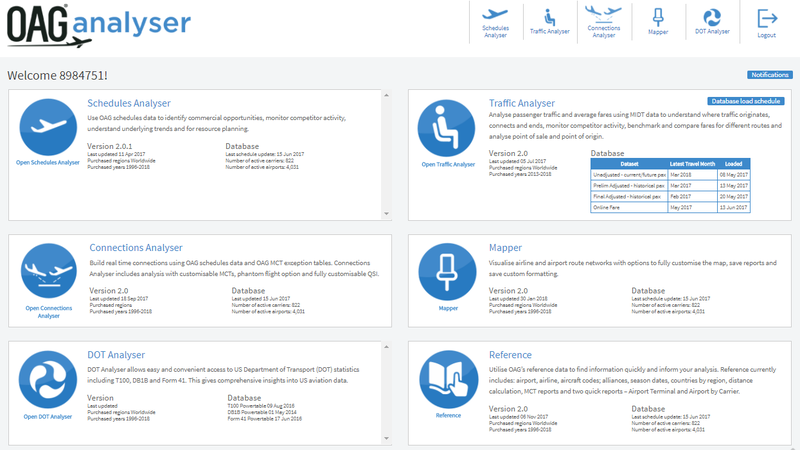 OAG Mapper sits within the OAG Analyser Suite of modules, each accessed via a common dashboard. Each module has been designed to have a high degree of commonality so that screens are visually comparable, and users of one will find it easy to use the other products and create outputs in similar and comparable formats where needed. 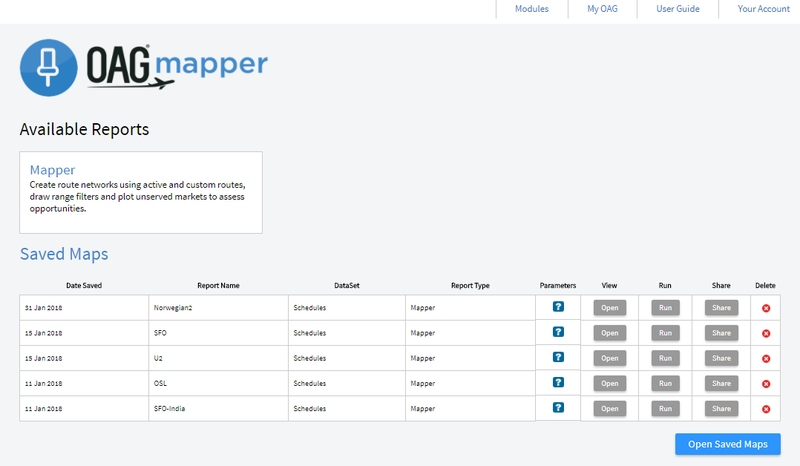 This short guide provides all the information you need to start using OAG Mapper. It has been designed to walk you through all of the steps involved with getting the data you need from Mapper and can be used on its own, or in conjunction with the user guide videos on our website. If you have any log in or account issues please get in touch via ContactUs@oag.com. If you would like to give feedback on your experience of using Mapper or if you have any problems using this tool please contact your account manager and they will be able to help you or pass you on to the revelant department to help. When you log into OAG Analyser you will see a screen like this which is the dashboard for the OAG Analyser suite of products. Each product you have access to is listed along the top right and also in middle of the screen. Your account number is located at the top left of the screen, where it says welcome, and you need just one account and login to access all of the OAG Analyser products you subscribe to. To open Mapper, the module covered in this user guide, you can either click on the module name at the top of the screen, or click on the pin icon located to the left of the Mapper section. In the central area you will see the Mapper report and below are any Saved Maps. Along the top of the screen there are some additional functions. Firstly, there are quick access links to each of the modules you have access to as part of your licence. Next is the My OAG section which also allows you to access saved maps. You can also access a feature which allows you to customise groups of data to make running reports with similar queries easier. There is also access here to User Preferences. The functions in this section, and the reference section next to it, are covered in more detail in our other user guides for Schedules and Traffic Analyser. The User Guide option links you to OAG’s help pages which include this guide, some FAQ’s, a glossary and a video to guide you through how to use this report. 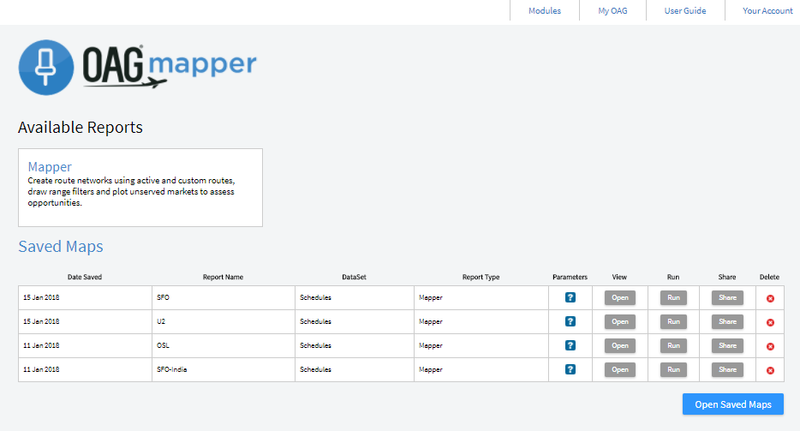 In this user guide, we will now take you through the Mapper Report and how to use it. 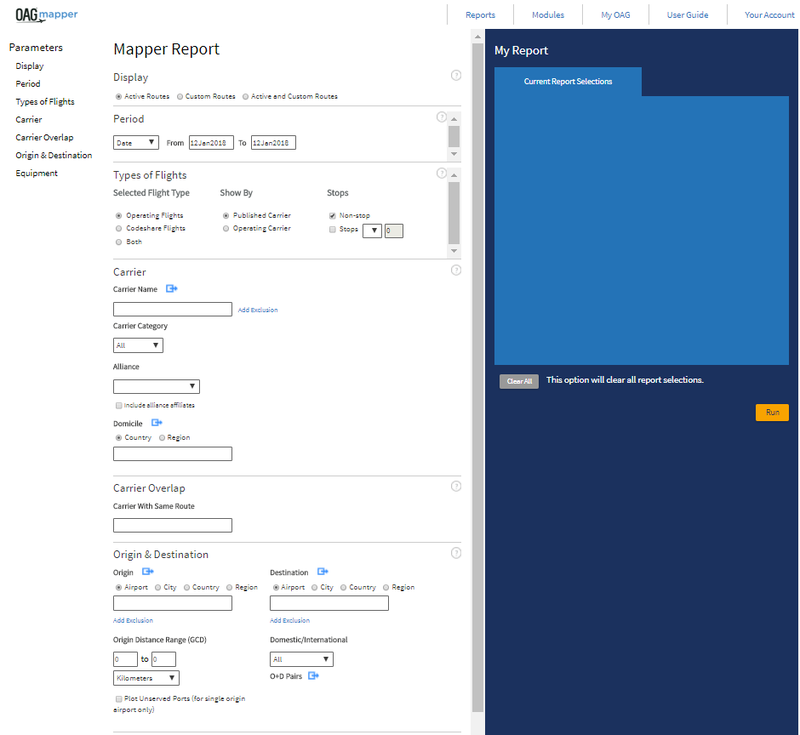 There is one report available in Mapper – the Mapper Report. We describe how it works here and provide you with a worked example in this section. You can also access a short video guide from our user guide that replicates the content provided here. 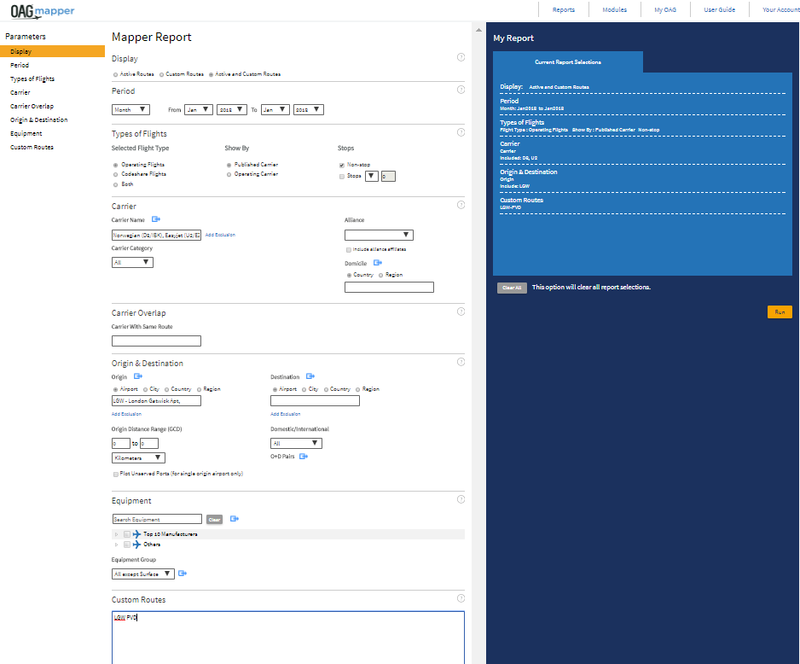 From the home screen you can click on Mapper under Available Reports and you will be linked to a new query screen which will look familiar if you are a user of other OAG Analyser modules. There are three distinct parts to the query screen. 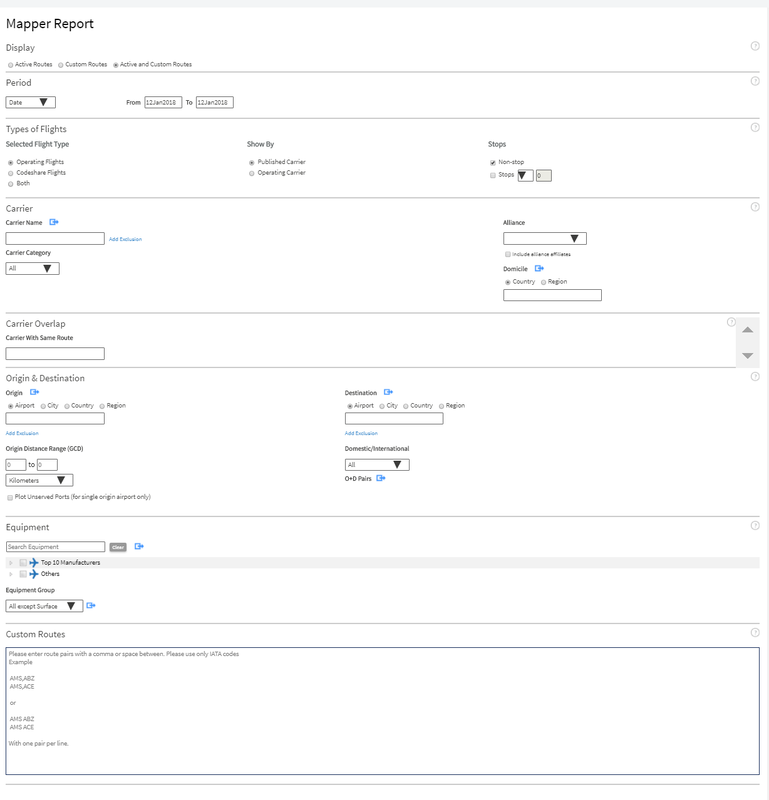 On the left are Parameters, in the middle the fields that you can use to refine these parameters and then on the right, your current report selections are displayed. Selecting Active Routes will return results for all active scheduled routes for the time period you select in Period. Selecting Custom Routes opens up a different window with a box which allows you to enter the route pair, or pairs that you want to visualise. Once you’ve entered a pair, or pairs, you can then go onto run the report by clicking on the yellow Run box, or select the Active and Custom Routes option at the top of the screen and the routes you have entered will be added to whatever query you choose to run. This can be useful to look at hypothetical routes alongside a carrier or airport’s existing network. If you now click on the Active and Custom Routes option, the Custom field appears at the bottom of the query screen. 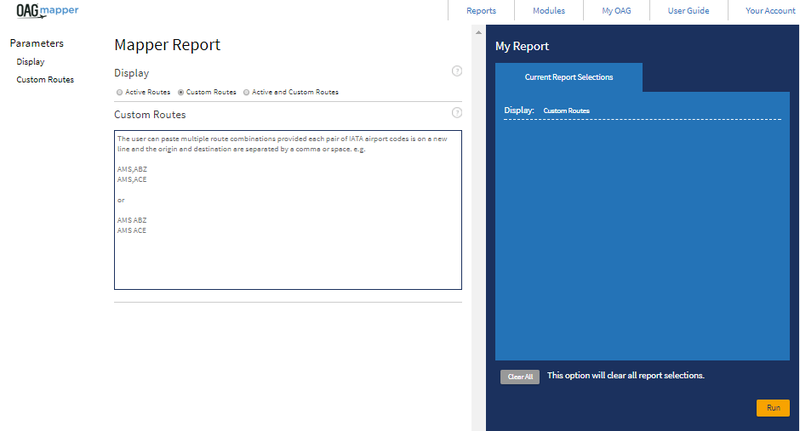 The best way to see how to run a report is to do an example. 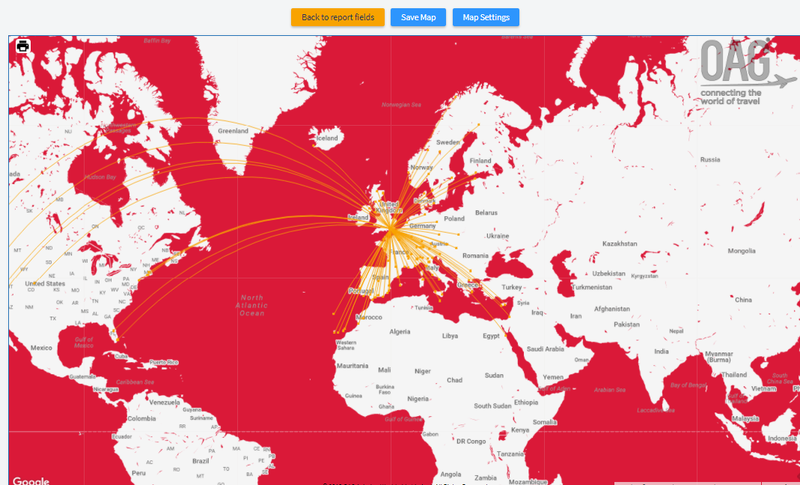 In this example we will be combining the Norwegian and easyJet airline networks at Gatwick Airport on a single map, and adding a hypothetical route which Norwegian may choose to operate using recently acquired airport slots. The hypothetical route will be from Gatwick (LGW) to Providence (PVD) in the United States. Start by selecting the Active and Custom routes option. The date will be January 2018. Select the two airlines Norwegian (in this example we’ve selected both of Norwegian’s two letter codes – DY and D8) and easyJet. Select an Origin which is Gatwick Airport. Finally, type the custom route LGW PVD. The blue area to the right of the screen will show the selections made as My Report. 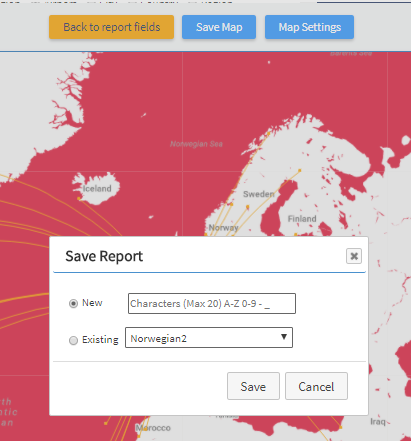 To generate the map, click on Run, under My Report. The next image is the map which is generated as a result of the above query. The next section looks at how to customise the map. 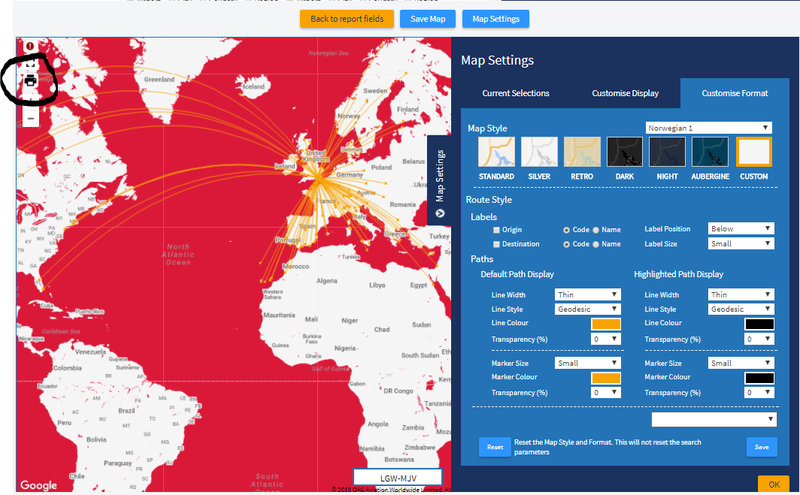 Every map can be customised in numerous ways from changing the colour and shape of the route lines, to adding labels for airports, and even changing the style of the map itself. Customisation can be accessed through the Map Settings. 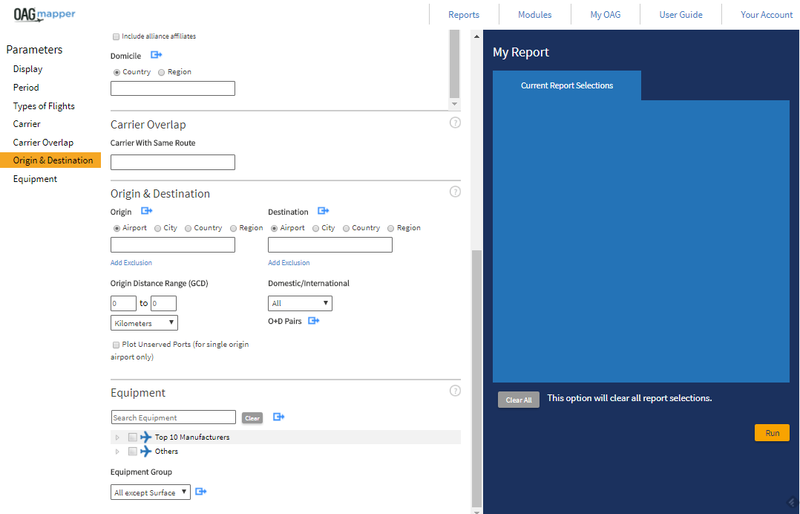 Map Settings have three tabs, the first being Current Selections which simply lists the report criteria used to generate the map. The second tab is Customise Display. The map appears in the default display mode where every route is shown in the same colour. Check boxes allow you to turn off any route or routes from the display, or highlight specific routes. There are another 5 display options. Selecting Equipment displays each route according to the type of aircraft equipment operated on the route, with a different colour for each aircraft type and uses white lines for routes where more than one type of equipment is used, and darker lines for the hypothetical routes for which no aircraft type has been assigned. Again, you can choose whether any particular route is displayed or not using the check boxes. 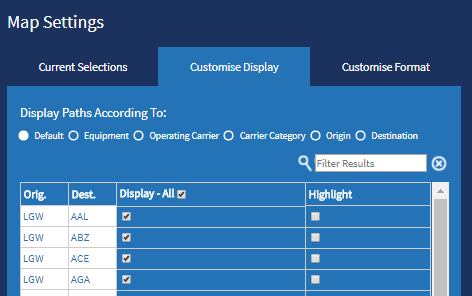 You can also use the Filter Results feature at the top of the table to choose only routes operated with one type of aircraft. The filter option only changes what is displayed in the table, not on the map. 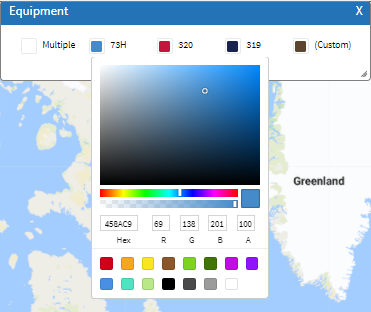 By clicking on each of the colour codes for the aircraft types a new dialogue box opens where you can make changes to the colours used, either using the colour palette, Red-Green-Blue number codes or HEX codes. The third option along the top is to show route lines according to airline. Again, routes where multiple airlines operate are shown as white lines and the hypothetical route is shown in a darker colour. 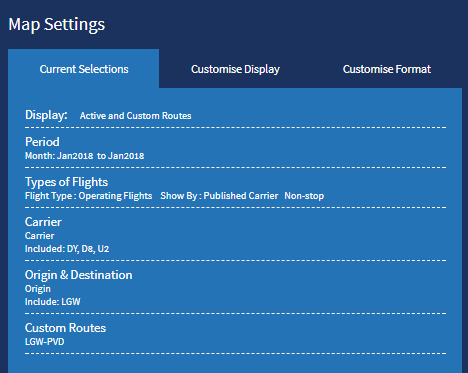 The fourth option displays routes according to the carrier category, either mainline airline or low-cost airline. A fifth option colour codes routes by the origin, in this instance that means they are all the same colour as Gatwick is the origin for all routes. A final option colour codes routes according to the destination and in this instance that means every route is a different colour. The third tab in Map Settings is Customise Format. To ensure the full functionality of this the Customise Display needs to be in the default option. 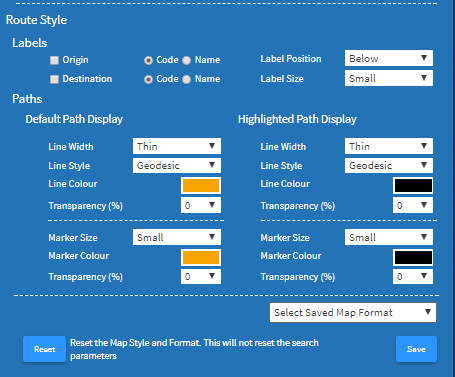 Customise Display provides the greatest degree of customisation and so the first of the options is one where you can save a map style you have created, and select a previously saved style. This is especially helpful if you have created a map style which matches your corporate or in-house style and want to be able to use it again, or if you have multiple maps which all need to appear with the same display features. 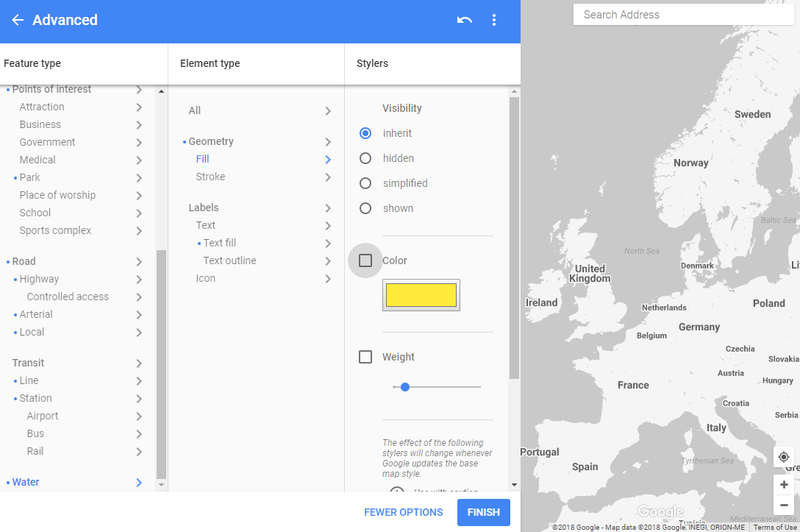 This is where you can access Google Map Styles which provide for much more customisation of the map itself. This is described in detail in Section 6. 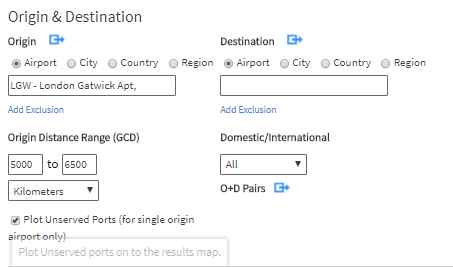 Below Saved Map Styles are options for how you wish the Labels at origins and destinations to be displayed, so airport names can appear as three letter codes or with the name in full. The location on the map relative to the location marker can also be changed, as can the size of the label. The central area of the options allows customisation of the route lines, or Paths. This includes changing the width of the lines, the style (straight or geodesic), colour and transparency. There are also options for the location markers including size, colour and transparency. On the right of this central area are the same options but for all highlighted routes. You can customise these options and they will remain as you customise them. If you want to return to the default options, click on Reset which clears any changes made. At the bottom the save function allows you to save the customised map and once saved, it appears in the drop-down list for future use. 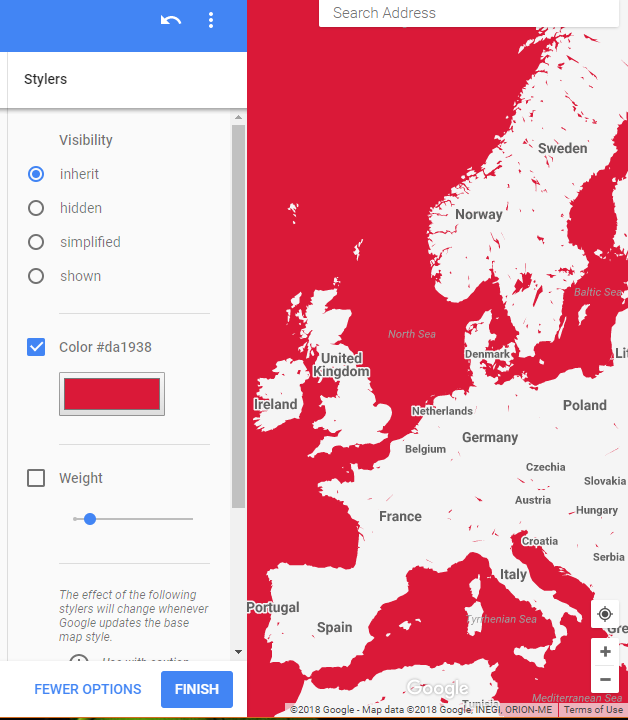 Mapper provides an option for users to change and customise the presentation of the standard Google map styles, so that the visual display of features like land characteristics, sea colour, and national boundaries can be changed. As well as changing the style of these features, you can hide features entirely. This means that you can emphasize particular components of the map or make the map complement the style of the surrounding page. The Map Theme provides an opportunity to change from the standard google map format to the Google Silver, Google Retro, Google Dark, Google Night or Google Aubergine styles, as shown below. If further customisation is required select Custom. This immediately opens a new dialogue box which will contain the Java Script Object Notation (JSON) which will define the features of the map but now it is empty. 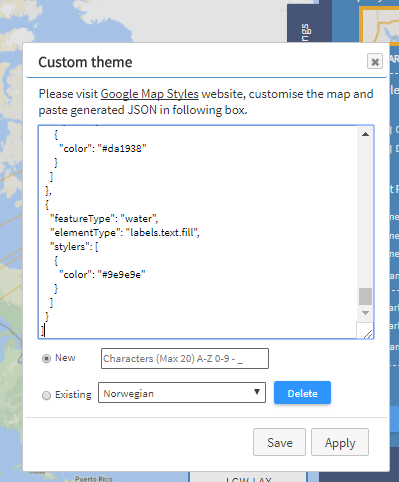 You need to click on the link to Google Map Styles in order to customise the map, and then paste the JSON generated in to the empty box. 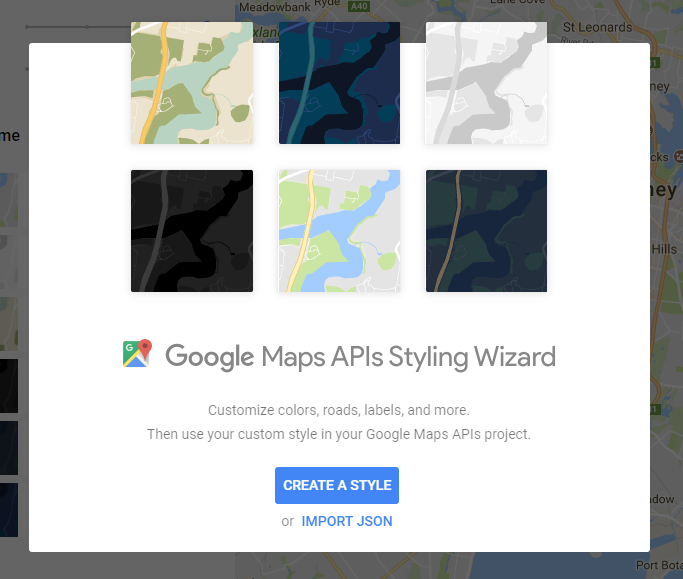 The Google Map Styles link takes you to a new window for Google Maps APIs Styling Wizard. Click on Create A Style. 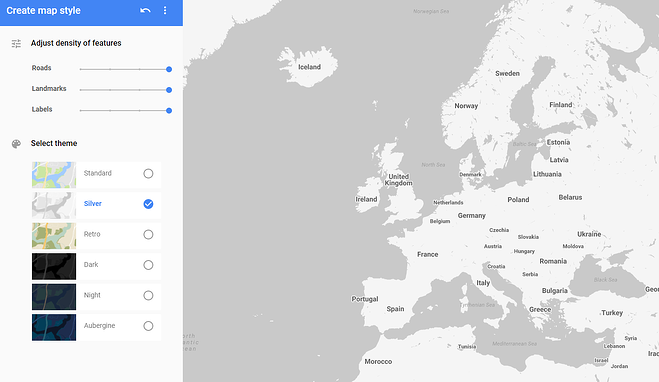 The next window repeats the various standard Google map styles that are available in Mapper. You’ll need to go straight to More Options at the bottom of the screen. The next screen contains a long list of map features on the left, each of which provide even more levels of customisation. It may be worth, first, changing the centre point of the map and the scale. Many of the maps created for route networks cross national boundaries and involve distances in excess of 500km so it is important to see how the features selected appear on a map of the scale that is required. The map below has been centred on Europe and covers an area similar to the one used for the report query used earlier in this User Guide. As you can see, there are many administrative area boundaries displayed, as well as major roads. To create a cleaner look you may want to remove those to start with. You can do this by selecting Administrative>Province> Stroke> Hidden and Road>Highway>Fill>Hidden. You might then decide to customise the colours on the map to fit with an airline’s corporate colours. In this example, we’ll continue with the worked example we used earlier, and use Norwegian. Firstly, we’ll select Fewer Options at the bottom of the window which takes us back to this page. We’ll choose the Silver option here, which removes the country boundaries and changes the colour of the sea to silver. Now we’ll format the sea in Norwegian red. Select More Options to open up the advanced dialogue and scroll down to water. Selecting Water opens another menu where we select Fill (highlighted in blue) and then we want to amend the colour by checking the colour box. Doing this opens up a box which allows you to customise the colour. 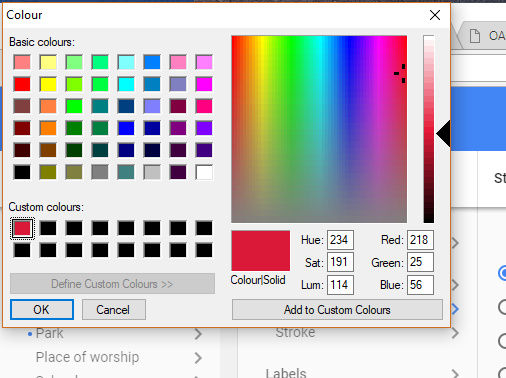 There are preset colours, or you can enter the hex code or RGB code. The Norwegian RGB colours are 218, 25 and 56 so we’ll enter those, add them to the custom colours in case we want to use them again. We then click on OK and the colour of the sea changes to red. That’s all we need to do here, so we select Finish and the following box opens. All we need to do now is export the JSON style directly into Mapper. 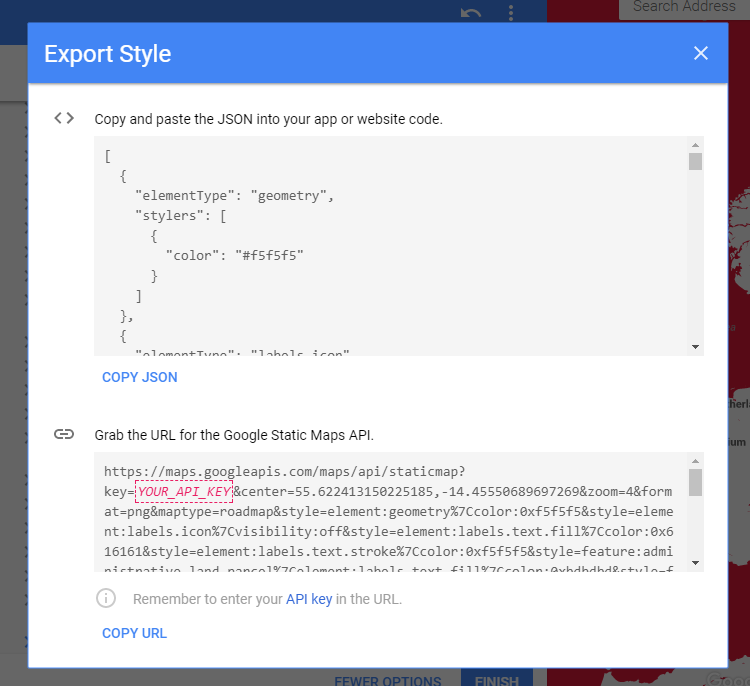 Clicking on Copy JSON highlights the JSON and copies it so you can now return to the Mapper page and copy it into the custom theme box. 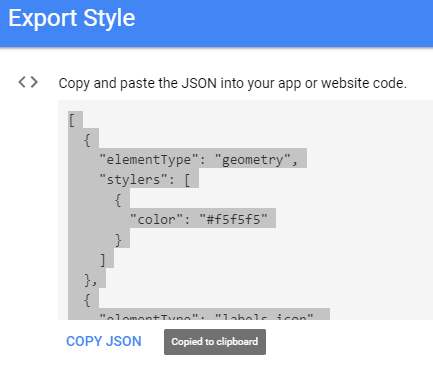 Once the JSON is copied in, you can select apply to see how it looks. Clicking on the map settings box closes it so you can review and then edit further by opening map settings again or save under an existing or new name. We could have made many more changes, adding or removing features of the map, and changing the way the map features are displayed. 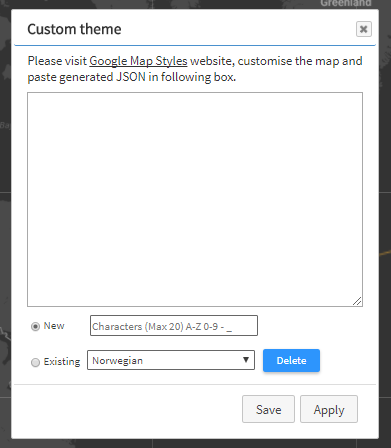 Once you’ve saved your customised style, it then appears in the Select Custom Map Style drop-down so you can use it in future. If you have an inhouse style of map you want to use over and over again then creating it here and saving it will make the task of producing all your maps in that style simple. 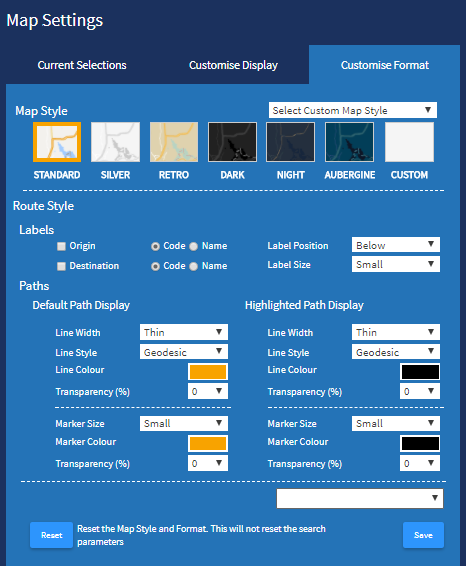 Once you’ve created the background map style you want, you can customise the Route Styles. The first option relates to labels, for origin and destination. You can choose to display airport codes or names, and then amend the location of the label and its size. The next set of options relate to the lines, or paths. You can vary the thickness, style and colour of the paths and their transparency, and also amend the marker size, colour and transparency. You can also amend the same fields for any highlighted routes that you select in the customise display field. Once you’ve made any changes to the paths you can save these as a map format which you can then select each time you want to use that specific set of formatting options. Doing this closes the map settings tab and removes the other icons from the map as shown below. Clicking on the printer icon again takes the map out of print mode. Once you’ve saved a map, it appears in the My OAG drop-down, in Saved Maps. This can be accessed from the tool bar at the top of the screen or under Saved Maps in the Mapper homepage. There’s another new feature in Mapper which is the ability to highlight unserved destinations within the range of particular aircraft types. 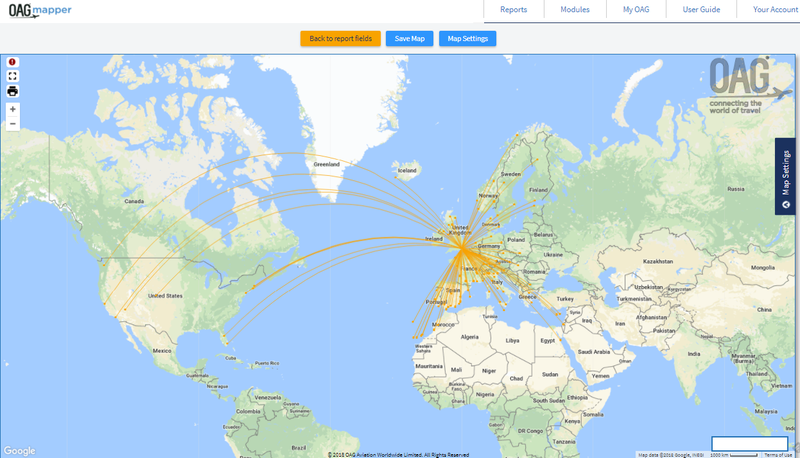 We’ll continue with the Norwegian example we used earlier and look at where else could be served in North America from London Gatwick using Norwegian’s Boeing 737 MAX aircraft. Starting back at the Mapper report, we click on Origin and Destination to move the query screen to there. We’ll add Norwegian as the carrier, Gatwick as the origin airport and in the Origin Distance range field we’ll enter 5,000 to 6,500 as we’re assuming the range of the Boeing 737 MAX is 6,500km. Just below the Origin Distance Range field we’ll check the Plot Unserved Ports box. 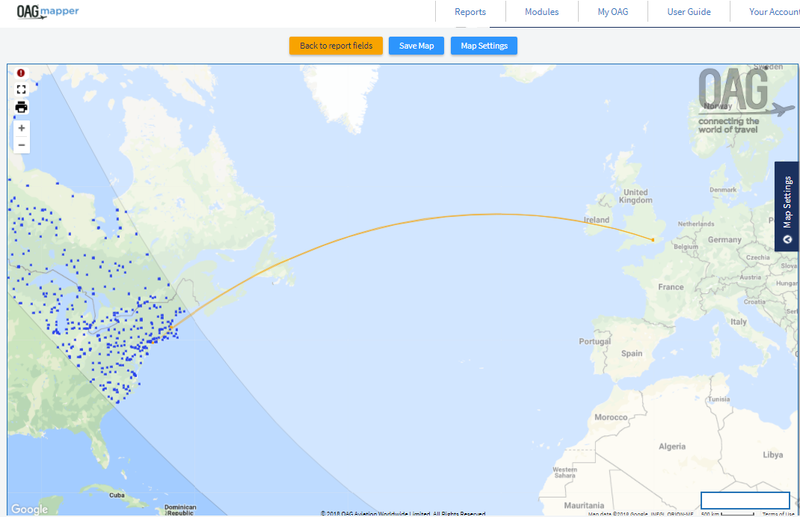 The map can be re-centred around the area you’re interested in, in this case the north east United States and zooming in shows the current routes operated by Norwegian to the US. 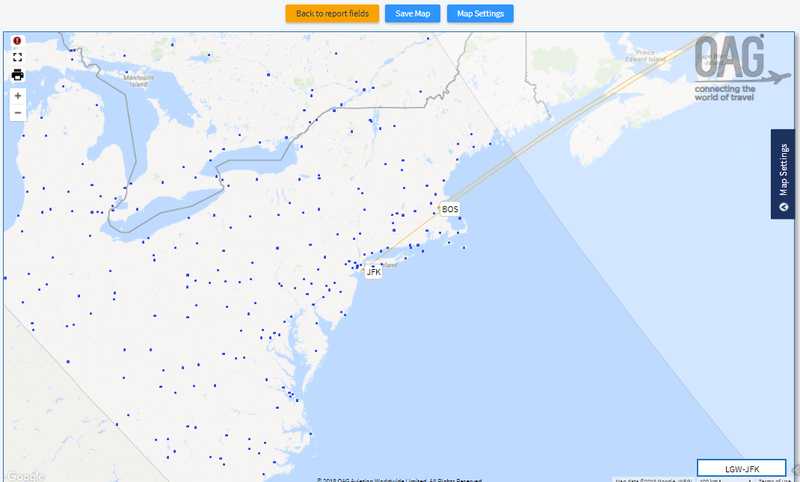 Each of the blue dots represents an airport in the US, with the range of the aircraft, but without service to Gatwick. The curved band is the range we’ve specified and so you can see from this, and the zoomed-in shot below that there are many airports which could be served with this aircraft. Hovering over the Dot identifies the airport, and you can use map settings to turn labels on and off for destination airports (existing routes) and for the unserved destinations. As before, the map can be saved for future use, or customised as described earlier.